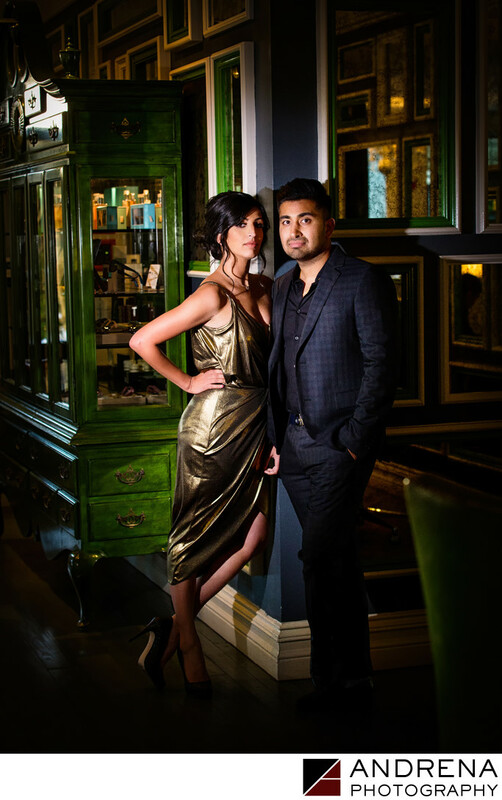 The Viceroy Santa Monica is a fantastic place to photograph a stylish engagement session. The hotel, which is located in Santa Monica, offers a boutique vibe and numerous stylish backdrops that lend an air of sophistication to any engagement or pre-wedding session. This hotel is my absolute favorite recommendation when a couple has flown into town for their engagement session, only to find that it's raining. The fee for shooting an engagement session at the Viceroy Santa Monica is $600, but many of my clients have found that fee to be well worth it, as the hotel offers so many unique and colorful places to shoot. Shoots must be arranged in advance by calling the hotel, and photographers must sign a contract upon arrival or prior to their shoot. The shoot fee includes valet parking. For this image, taken in front of the green-framed mirror wall in the hotel lobby, we used a high-powered video light to illuminate the couple's faces, while letting the light fall off towards the feet. In this way, I kept the focus on my couple rather than on anything else.